Baltimore is a notable city in Maryland, known for its rich history, unique cultural identity, and famous seaport. Home to over 600,000 people, Baltimore is a thriving city full of numerous businesses, restaurants, and attractions. Residents have an extensive selection to choose from for home improvement services. It is often difficult for consumers to sift through the masses and decide which provider would best suit their specific needs. The Cedar Square team is fully equipped with vital knowledge, skills, and experience needed to successfully accomplish any home building task. For multiple decades, we have built and preserved communities in Baltimore. Contact a representative today to learn more about how our services can benefit your home! If you’re looking to remodel your master bathroom, it is important to focus on the details. Bathrooms are complex and composed of several elements. These factors range from the hardware and lighting fixtures to the plumbing and electrical system. The visual layout of the room is equivalent in importance to the efficiency of the appliances installed. Design and functionality are both the key to proper bathroom remodeling and should be prioritized equally. Changing the established style of the bathroom is essential to revive the space and make it seem brand-new. Many factors impact the visual design of the room and can be modified to transform the space. For example, the bathroom handles, doorknobs or faucets could be updated with modern materials or finishes. This subtle change streamlines the style of the room, modernizing the décor. Other design renovations include interior painting, custom cabinetry, or flooring installation. 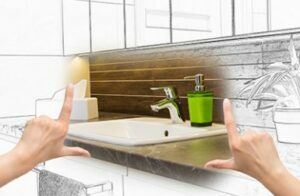 Plumbing and electric are integral to the bathroom efficiency and a high priority during renovation. The bathroom is only as strong as its foundation and strengthening the plumbing and electrical systems will strengthen the room. If you change the layout of the bathroom during renovation, the plumbing will need to be modified to accommodate these changes. These changes could include moving the location of the sink, expanding the width of the shower, or installing a freestanding bathtub. Convenient outlets will assist innovative appliances such as electric toothbrushes or hair styling devices. Often, the electrical system will need to be changed to support new lighting fixtures or fan systems. Cedar Square Homes is the resource you need for all custom home builder projects in Baltimore, Maryland. From kitchen remodeling to home addition construction, our team can support you in a variety of projects. Contact us today and explore our services for more information!